Mention “Broadway” and you likely picture one of the most famous streets in the world – and, hear the music: “They say the neon lights are bright on Broadway,” “Give my regards to old Broadway” and many others. The Dutch renamed it “Breede Weg,” which eventually morphed to Broadway. But even then, parts of the road were called Great George Street, Kingsbridge Road, Bloomingdale Road and Western Boulevard. 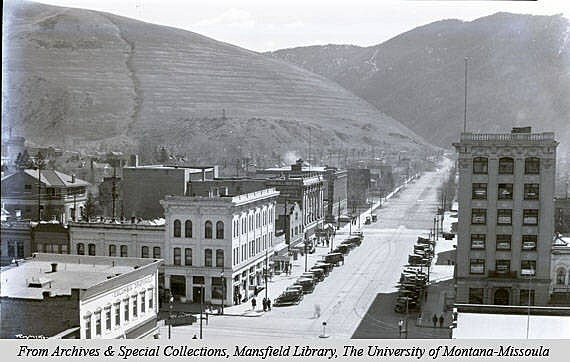 Missoula’s Broadway wasn’t always “Broadway” either. 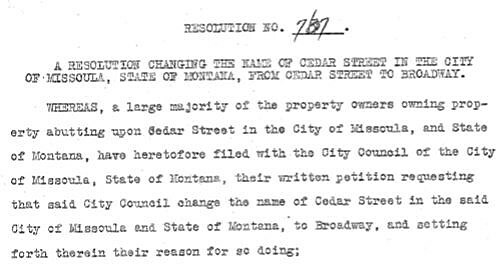 In fact, for the first 60-some years of the city’s existence, it was “Cedar” Street. From the 1860s to the 1920s, Cedar Street (and the city, for that matter) spanned roughly the area from Rattlesnake Creek (then called the Rattlesnake River) on the east, to just past St. Pat’s Hospital. The street ended a short distance later, so folks who wanted to travel farther, would have to turn onto May Street and find their way to Toole Avenue which then connected with the roadway toward the west. But with the advent of the automobile, there was a desire to have a single, long, broad, straight through-street linking the road east and west of Missoula. So downtown business leaders began a petition drive in May 1928. They wanted to extend Cedar Street to connect with the route west of town and, by the way, why not re-name it “Broadway” at the same time? But we may never know why they proposed the name “Broadway.” The petition, containing the property owners’ reasoning, eludes discovery in the city’s files. 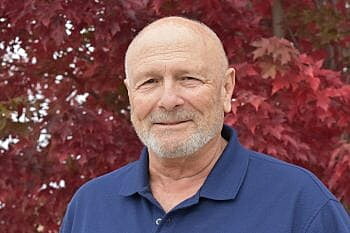 The following day, City Clerk H. K. Powell posted notices of the change at the U.S. Post Office, City Hall, County Courthouse and the Fire Station – and the deed was done. 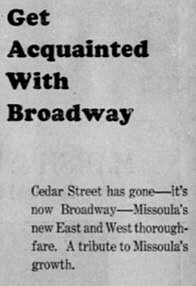 The newspaper section, featuring advertising from merchants along the newly renamed street, declared, “Cedar Street has gone – it’s now Broadway – Missoula’s new East and West thoroughfare. A tribute to Missoula’s growth. A few weeks later, the City Council began making another nod to the automobile, proposing Higgins Street be an “arterial highway.” The move would give the right of way to autos on Higgins, requiring cars on side streets to yield. It may not be the “Great White Way,” but our “Broadway” is home to the world-acclaimed Missoula Community Theater (MCT) at the fashionable intersection of East Broadway and North Adams. By the way, you’d better hurry to get your tickets: The MCT production of Disney’s “Newsies” debuts in just a few weeks!